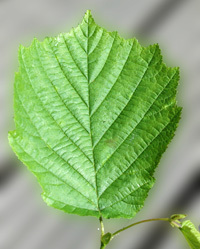 The hazel is a small tree, usually coppiced and therefore has multiple stems. A single, maiden tree that has not been coppiced (a standard) can live for about 60 years, but coppiced can live up to 500! The leaves are arranged alternately around a stem, round in shape, and broadest near the tip. The leaf is hairy on the underside and on the stalk and is noticeably toothed. The male and female flowers are found on the same tree. The yellow male catkins open in early spring – sometimes known as "lambs tails". The female flowers appear on the same branches as small pink/crimson tufts. Fertilised flowers may develop into brown nuts in the autumn (though squirrels often eat them before they ripen). 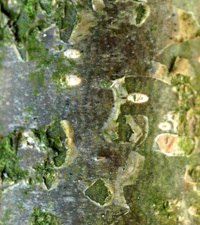 The young bark can show signs of peeling.